Big Data refers to the volume, velocity and variety of highly-structured, semi-structured and loosely-structured data that is in motion (streaming) and at rest (stored). The analysis of Big Data presents tremendous opportunity to gain competitive advantage through better business, technical and customer insight. However, most approaches to Big Data analytics only work with Big Data at rest. This means that analytic results, such as trends and patterns, only consider what has happened in the past without consideration for what is happening at this moment. 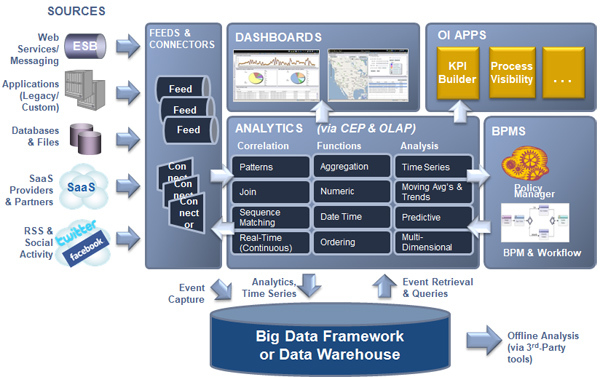 Vitria Operational Intelligence (OI) provides real-time visibility into both Big Data in Motion and Big Data at Rest. Big Data in Motion includes data from smart grid meters, RSS feeds, computer networks and social media sites. Big Data at rest includes data residing in databases, data warehouses, enterprise applications and Big Data frameworks such as Hadoop implementations. Modern organizations require 360* of visibility into operations to be fully informed. Even more so, they need analytic results in time to gain a competitive advantage. and efficiency levels that were previously unattainable.